NARC is a dynamic action game, produced by the development studio VIS Entertainment. 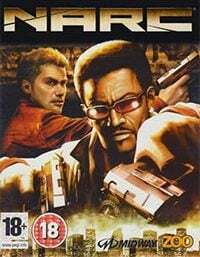 The player plays the role of a member of the title, elite police unit and carries out missions related to the fight against crime and drug trafficking. publisher : Midway Games | Zoo Digital/zushi games ltd.
NARC is a mission-based 3rd-person action game set against a stylized, modern-day backdrop of the War on Drugs. Players take on the roles of elite NARC squad members Marcus Hill, a DEA Agent with a squeaky clean image and Jack Forzenski, a cop on probation and fresh out of rehab. Together they investigate a new mystery drug that has hit the streets called liquid soul. In the fight against a powerful international drug cartel Marcus and Jack will encounter a web of lies, betrayals, and a cast of underworld characters. Will they succeed in their war or will they give into the temptation?